Sloth love Chunk, and getting the high score on a brand new pinball machine. 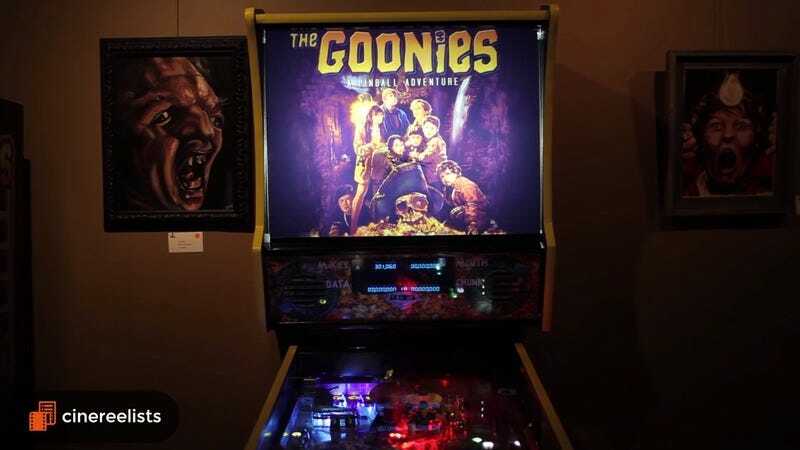 Mike Johnson from Orlando, FL, has produced a custom pinball game dedicated to the 1985 Richard Donner film, The Goonies. Apparently there had never been a pinball machine dedicated to the misadventures of Corey Feldman before, so Johnson decided to fill that void with his own creation. Johnson, a pinballer, Goonies fan, and butch-Salvador Dali-mustache enthusiast, put lots of thought and energy into designing the game to mirror the action of the film. Cinereelists sat down to make a video of Johnson’s game as well as interviewed him for its movie-themed podcast. It’s an impressive amount of work that perfectly executes the marriage of two hits from a bygone era.